I am a big believer in the idea of fractional shares. Our fund Social Leverage has made a few seed investments in the personal investing space that speculate on the idea that fractional share investing for the individual will be a mainstream offering. One is Sparkfin and another is Etoro. Maybe Robinhood will look at offering it one day in the future. At Stocktoberfest a slew of new startups will show off their products and solutions for personal investing in this area as well. Fractional shares is not a new idea. Smart Beta, robo investing and ETF’s continue to explode in popularity. These products buy and sell fractional shares daily and just pool them for reallocation. Sadly, while the next generation is excited about investing, the stock market is shrinking. I wrote about it a few weeks ago. The one thing we are hiding from the next generation of investors (the millennials) in a shrinking stock market is a way to efficiently buy individual stocks. An 18 year old person today can have a bank account, a gun (certain states) and on demand movies,cars and food on their smartphone but not the ability to invest $500 in a company they love. The biggest market capitalization companies do not like to split their stocks anymore (Google at $800, Priceline at $1400, Amazon at $800). I like that. Management knows splitting the stock does not add true long-time value value. Stock splits likely just increase trading, not sticky ownership which is what public companies want. At the same time, Robinhood is proving that a younger generation wants to invest in single stocks and save. Stocktwits is as well. Our users median age continues to drop as our mobile apps grow in popularity. 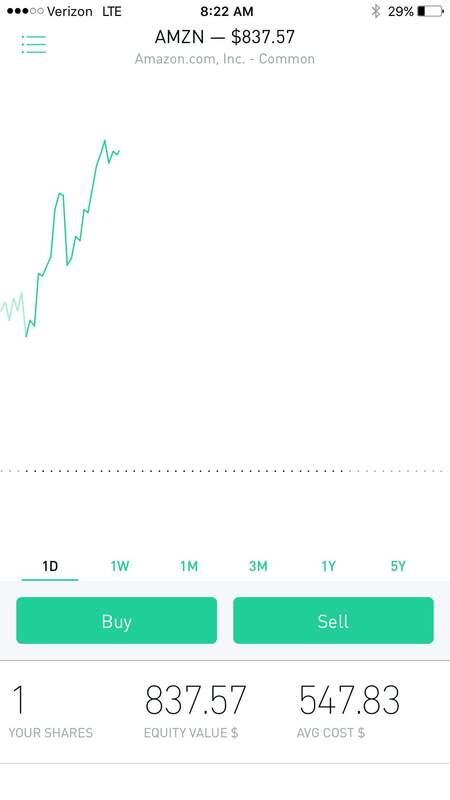 My daughter is in college and last year she started buying individual stocks on Robinhood. One of here first buys was Amazon. She bought 1 share of stock for $547 and today it is $837. Here is a screenshot of her account. She can only sell the 1 share or buy more full shares. She would love to be able to sell $300 worth of Amazon and diversify into $100 of 3 more stocks so she can start building her own portfolio. It’s not rocket science to build or teach portfolio construction and risk management with the tools we have today. Of course, if Rachel had $100 million she could go to Goldman Sachs and they would create ANY derivative she wanted to put that money to work. Here is a great story about how Goldman Sachs abused Libya with single stock derivatives. If you are rich and stupid and lazy you get to learn the hard way. ETF’s are great. The stock market shrinking is NOT great. We should want a healthy stock market. It should not be a casino just for mood bets and a place where robots buy baskets of stocks. The next recession/big correction will bring about these changes I want. I am looking forward to this future.